Wig Hair Care Products: Wig Shampoo & Conditioner, Frizz Reduction Serums, Wig Stand & Wig Caps We Price Match! 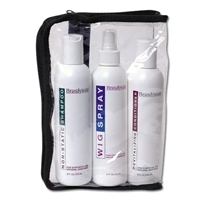 Our collection of wig care products are made specifically to keep your new wig and hairpieces looking their best. The proper wig care will allow you to extend the life of your wig. Regular shampoo and styling products can damage wigs. 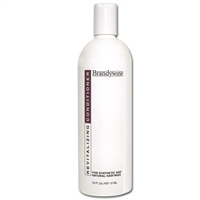 The Brandywine products we carry are designed to be gentle: extending the life of the synthetic wig fibers, yet providing the right amount of moisture for the human hair wigs to remain glamorous. The better the wig looks, the longer life you can expect from it. Our wig care products are the answer to finding exactly what you need in order to maintain your investment. Our Jorgen and La Gem products are fantastic for keeping your new hairpieces from fading, while helping to smooth the cuticle, they eliminate frizz, and help control tangles and matting for a healthy look from root to ends. Our travel size kits are the airport-friendly, making them the perfect product to bring along while en route. Worried about your wig slipping or moving around on your head, making you feel less secure- No Worries our miraculous Non-Slip Wig Kit is the answer you've been waiting for. Our Alopecia patients swear by this amazing material, which eliminates the use of glue or tape, it naturally adheres by working with the heat of your scalp, keeping your wig securely anchored. Keeping your wigs and hairpieces moisturized with our leave in conditioner or Diamond Glass (a serum product with silk amino acids) keeps the hairs from getting dried out, reducing frizzy ends. The hairs will remain shiny and radiant for extended wear.